Free Republic made its debut in September, 1996, and the forum was added in early 1997. Over 100,000 people have registered for posting privileges on Free Republic, and the forum is read daily by tens of thousands of concerned citizens and patriots from all around the country and the world. A Few of FR's Finest....Every Day was introduced on June 24, 2002. It's only a small room in JimRob's house where we can get to know one another a little better; salute and support our military and our leaders; pray for those in need; and congratulate those deserving. We strive to keep our threads entertaining, fun, and pleasing to look at, and often have guest writers contribute an essay, or a profile of another FReeper. If you have a suggestion, or an idea, or if there's a FReeper you would like to see featured, please drop one of us a note in FR mail. We're having fun and hope you are! 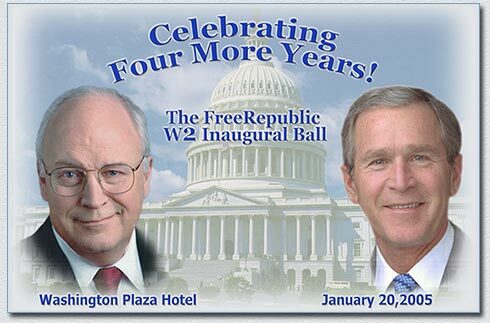 How to describe the W2 Inaugural Ball? Words fail me (as they so often do), so I will post photos and let them speak for themselves. It is my hope that they will convey just how wonderful and exciting it was to be a part of this momentous event! "Jaban Shalal's companion (nephew or brother, not sure) told me that the media will not tell you but the citizens of Iraq have pictures of President Bush in their homes. The Iraqi people say "Thank you George Bush; Thank you America!" The Iraqi people love George Bush. What a pleasure it was to meet so many FReeper FRiends and what a disappointment to miss seeing everyone. While on my way to the kid's room, I saw Bob Barr but I did not get a chance to talk to him. He was surrounded by others. When I returned I could not find him in the crowd. The DC chapter did a wonderful job on the kid's room. They not only set up a TV with kid's movies available but supplied coloring and activity books. Everytime that I checked it, the kids were having a wonderful time making new friends. I was told that Jim Robinson even got out to the dance floor for at least one dance. Way to go Jim!!" ~ JustAmy. JustAmy and I have more photos that we will post, and I hope, if you were able to attend the Ball and/or the Inauguration, you will post your photos or links to them here on the Finest thread, as well as your memories of this exciting event. It was wonderful getting to meet so many freepers that I have long admired on this forum. My only regret is that I did not get to meet those who were unable to attend. God willing, I will have another opportunity someday soon. And finally, congratulations and a Finest salute to President Bush and Vice President Cheney. May God bless and guide them through the next four years, and may God bless America and our military!! Opinions by our own 'King of Ping' The guy's good, folks! 1) Click on the graphic to open the Calendar. 2) Once there you can click on any month and even click to the right to go into next year. Once you are in the month that you joined FR you will need to click on the number in the calendar and then an add item screen will come up. 3) In the next box enter your name in the "Calendar Text" field and then click on submit. 4) If any of the screens fail to load simply click on refresh in your browser and that will usually fix it. and include Freeper Photo Album in subject line. Good morning, everyone. I hope you enjoy today's thread. If you would like to be added to or removed from the Finest ping list, freepmail me. Thank you so very much for this wonderful work. More FReeper Ball pics... we shoulda gone! Always good to see pics of Syncro. Where's bootless' cowboy hat from the last ball? Oh, that's what Mudboy look like. I had two choices: Go to Hawaii in November to see one Freeper, or go to D.C. in January to see hundreds. OK, going to be now fer sure! Yes, you shoulda. You missed a great Ball. You must come to the next one. Hopefully in 2009 we will be celebrating another Republican victory. Oh, Mama Bear, I just love this thread...What a wonderful treat to put names with faces..Hope you are feeling better ! Well, climate-wise, you definetly made the right choice. The weather could have been better, but it was January in DC. Cold snowy weather is par for the course. I am heading for bed real soon. HUGS! Gigantor - Gov. Huckabee - Brand new Freeper BrianNYPD, had a great time meeting Freepers at the Ball that he came home and registered. Thanks for adding your photos, Gigantor....it was a GREAT Ball, wasn't it? More fun than a human bean should be allowed to have, huh? The only down side was it ended too quickly - and then they flashed the lights on us at the after-Ball party much too soon! These photos are making me more wishful that I was able to go to the W2 ball! There are so many FReepers there like Spookbrat and Jen thai I wantd to meet and You and Amy and Phancy and Guffy among others too. I'll be checking in later to read more of your day and evening. Thank you for the tickets even though I ennded up not being able to use them. I'm sorry for the short notice. Here are some pictures you'll be interested in, including pictures of Jim Robinson, founder of FreeRepublic. I am so sorry that it didn't work out that you could come to the Ball. Plan on coming in 2009 when we celebrate another Republican victory. I will be there for sure!